Since this season began, it has been the strangest I can ever remember. I don't really mean on the field, necessarily. The action on the field — until last weekend, anyway — had been relatively formulaic. It's been a weird season for me personally, for my family and for Alabama in general. The season started really before I was ready for it, without us in the building or even in town for the first time since 2008. There were two road trips, a home game, some tailgating ... but mostly, we were somewhat separated from the action this fall. It was different, but not necessarily a bad thing. One of the reasons for the difficulty, though, was my grandfather's ongoing battle — and he battled it all the way — with cancer, which began in one place and just kept spreading (as cancer will, I suppose). The weekend of North Texas, we were at his house, taking in a day of football and attempting to make the moments last forever. The day after the heartbreaker vs. LSU, we were at his bedside again, as he struggled to keep his eyes open and his mind in one place (all the while wondering why Alabama's kicking game could do no better). He died very early Wednesday morning. And so Thanksgiving Weekend — and the Auburn game that caps it — was even more a family affair than usual. We all missed most of Arkansas-LSU receiving visitors at the funeral home; nobody saw ESPN's College Gameday, because we were at the graveside service. By the time we sat down to actually watch the game, there were myself, my wife, my mom (an Auburn fan whose family has owned season tickets for almost as long as there's been such things), my dad and his sister — all of whom have spent the last month caring for their dad, alternately laughing and crying — and it seemed somewhat strange that anyone was even playing a game. Only a year ago, I remember walking out of Bryant-Denny Stadium a shivering, angry person; on Saturday, the first time since 1997 an Auburn-Alabama game kicked off without me in the building somewhere, I was calmly sitting on a couch and wondering how anyone could care so much. "The rest of the world kept going this week?" I thought. "I'm somewhat surprised." Dad said he felt the same way. "If we're gonna play, though, we need to win," he said. 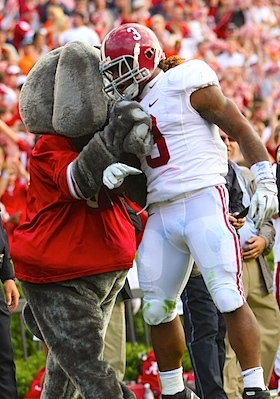 In a way, the aftermath of Saturday's 42-14 win at Auburn has been an indicator of the entire season for Alabama: nobody's talking about the result, so much as whether Alabama deserves a BCS rematch with LSU (Cecil says yes, but then again, of course he does). If there was an enduring image from Saturday, it was Trent Richardson's 57-yard run in the fourth quarter to seal the deal, the one where he slapped away a defender like a boxer swatting at a gnat. That summed up the game for Bama: For all the bluster about "Never again" and "four quarters" and all that noise, when it came down to it, Auburn was a team in Alabama's way in 2011. Just like Ole Miss, Mississippi State, Tennessee and the 12 other teams on the schedule that aren't LSU. The past two seasons, Auburn has appeared to be more prepared to play than Bama; there were things the Tigers did that Alabama seemed unprepared for. Not this time — the two best plays for Auburn all day were a pooch punt and a kickoff return. On the one hand, Alabama was a much stronger team, so the end result didn't come as a huge surprise to anyone outside the state. At the same time, nobody goes to Auburn and whips the home team like that. I mean, not ever. Alabama fans have a right to take satisfaction in that result, no matter the records. And that's a pretty good ending to the weirdest football season of my lifetime. I'm sure Granddad enjoyed it.